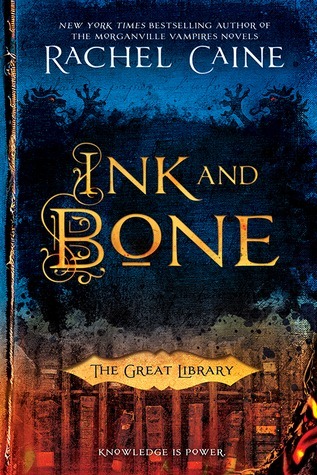 It didn’t take much convincing for me to pick up Ink and Bone, the first book in Rachel Caine’s The Great Library series. I was already a fan of Caine’s work. (I was slightly obsessed with her Morganville Vampires series for a while.) Also, Ink and Bone was recently named to the 2017-18 South Carolina Young Adult Book Award nominee list. So, it wasn’t so much if I would read this book but when. I’m pleased to report that I finished Ink and Bone earlier today, and it was both awesome and disturbing. I’m sure many of my fellow librarians would agree with that assessment. Ink and Bone is, in a nutshell, an alternate universe where the great Library of Alexandria was never destroyed. In this world, the Library controls nearly everything. With the help of alchemy, the Library can transmit books instantly, but it’s illegal for anyone to own personal copies of books. The punishment for anyone who does–or for those who deal in smuggled books–is severe. For Jess Brightwell, smuggling books is the family business. It’s all he’s ever known, and he doesn’t much like it. Now, his father has a new task for him. He’s to become a postulate in the Library, being trained for eventual service to the Library. His dad wants Jess to use his new role for information. Jess agrees, but he finds himself in the midst of more danger than he could have ever imagined. Even though Jess has spent his life thumbing his nose at the Library, he believes it does important work. That belief, however, will soon be tested. Jess and his fellow students are asked to basically enter a war zone to retrieve some rare books. In the process, they see death, destruction, and the absolute worst of humanity. It doesn’t take long for Jess to grasp that the Library truly does place more value on knowledge–and its exclusive hold on that knowledge–than it does on human life. The more Jess learns about the Library, the more he questions what’s really going on around him. Those questions only multiply when he realizes how far the Library is willing to go to preserve its power and keep its secrets. Is there any way for Jess to stand against such a powerful entity? What will happen to him and his friends if they get in the Library’s way? A world in which a library runs everything. The librarian in me is thinking, “That sounds absolutely wonderful.” Yeah…not so much. As the saying goes, “Absolute power corrupts absolutely.” I guess that’s true for librarians, too. In Ink and Bone, the Library will do whatever it takes to hold onto its power, even spying on, sabotaging, or killing its own people. Jess and company witness the Library commit horrible atrocities in this book, and it often feels like they are helpless against such brutality. Even at the end of the book, there’s barely a glimmer of hope. But there is some hope, especially given that there are two more books in this series. Book two, Paper and Fire, is already out, and book three, Ash and Quill, will be released on July 11th. Something tells me that things are going to get worse for Jess and company before they get better, but I have every intention of reading the rest of this enthralling series, no matter how painful it may be. In case you were wondering, I would recommend this book for teens, adults, and perhaps some mature middle school students. Ink and Bone is full of savage violence and intrigue, and, while it could generate some very interesting discussions (especially in our current political climate), I don’t think this book is geared toward most middle grade readers. If you’d like to learn more about Ink and Bone and other books by Rachel Caine, check out the author’s website. You can also connect with the author on Twitter, Facebook, and Tumblr. Normally, I’m not a huge fan of surprises. That’s not the case when I read. I kind of love it when an author takes what I think I know about a story, flips it around, and gives me something unexpected. That’s just what happened in Mobile Library by David Whitehouse. (The title should tell you why I wanted to read this book. Thank you, NetGalley, for the opportunity!) This book won’t be released to the masses until January, but I recommend putting it on your to-read list now. Mobile Library begins with a glimpse at the ending, and I thought I had things figured out. Let’s face it. Many, many books are rather predictable. I thought this one would be no different. This is one instance when I’m glad I was wrong. Bobby Nusku is a kid with a rather sad life. His mother left a long time ago. He walks on eggshells around his father and Cindy, his dad’s horrible girlfriend. He has only one friend at school. He’s a target of bullies. Bobby’s big plan to get back at those who would hurt him is to turn his best friend, Sunny, into a cyborg. As one can imagine, that plan doesn’t exactly turn out the way Bobby would have liked. Sunny is taken away, and Bobby is left all alone in the world. Things change, however, when Bobby encounters Rosa, a girl whose disability makes her vulnerable to bullies, and her mother Val. These two kind people offer Bobby a refuge from his life. Val cleans the town’s mobile library (known to many as a Bookmobile), and she introduces Bobby to the escape offered in the pages of books. Val provides Bobby the love he’s been starving for, and Bobby quickly becomes part of Val’s family. But not everyone understands their relationship. They think something sordid is going on, and that results in ostracism, vandalism, and Val losing the job she needs to care for herself and her daughter. Even though he’s been warned away from Val, she’s his only solace after his father beats him one night. He runs to her house, and Val knows she has to do something to get Bobby away from his dad. So what does she do? She takes Rosa, Bobby, her dog Bert, and she steals the mobile library–the one no longer used by the town, the one she still has the keys for–and escapes into the night. Val realizes that she and her small family are always one step from being found, and she’s always looking over her shoulder, but she and the kids soon find help in an unexpected place. While hiding out in the woods, Bobby runs across Joe, a homeless man with reasons of his own for staying under the radar. Joe joins forces with Val, Bobby, and Rosa, and this ragtag team journeys across England and into Scotland in the hopes of finding safety, peace, and a home of their own. Once again, though, things don’t go exactly according to plan. The authorities are closing in on Bobby, Val, and company, and they’re running out of places to hide. Is anyone willing to help them? Can they get out of this mess and still remain together? What will become of Bobby, Val, Rosa, and Joe, and will anyone ever understand how these people came together to form their own family within the walls of a mobile library? Is there any hope for a happy ending? Find out for yourself when you read Mobile Library, an novel by David Whitehouse! I love all of the misdirection in this book. I had several “What the crap!” moments while reading, and that’s always fun. I admit that I jumped to some conclusions at the beginning of the book (which was also the ending) that mirrored the town’s concerns regarding the relationship between Bobby and Val. That was just one thing that was turned on its ear. There were quite a few surprises in this book, and their eventual revelations made for a page-turner of a book. The librarian in me enjoyed the literary allusions in Mobile Library…not to mention the bulk of the story actually occurring in a library on wheels. Bobby’s reading list will connect with those who’ve read the same books…and it may just encourage others to pick up the books he’s enjoyed so much. Even though a few of the characters in this book are children, I think Mobile Library is definitely an adult book. Some teen readers may be fine with it, but this is a book with a lot of subtext, a bit of profanity, and some mature situations. 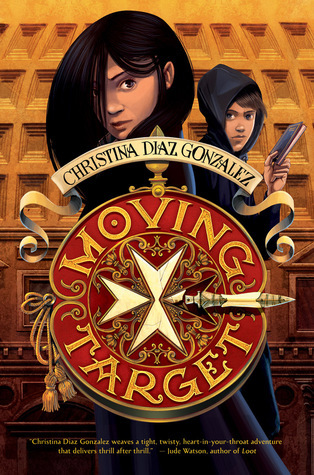 I would recommend this book for public library collections. Not so much for school libraries. Mobile Library won’t be released in the U.S. until January 20th, 2015. (The U.K. release is set for January 8th.) So, unless you’re a member of NetGalley or have some other source for advance copies, you’ve got about a three-month wait for this book. It’s worth the wait. If you’re interested in learning more about Mobile Library and author David Whitehouse, check out the author’s website, Goodreads, and Twitter. It took me a little while to get into Escape from Mr. Lemoncello’s Library, but, once I did, I didn’t want to put the book down. (I imagine that most library/book nerds will be able to relate.) It reminded me of The Gollywhopper Games by Jody Feldman and my absolute favorite children’s book, Charlie and the Chocolate Factory by Roald Dahl. (Even the characters in the book recognize the similarities between their situation and Charlie Bucket’s adventures in Willy Wonka’s candy factory.) While the kids in this book are competing for a fantastic prize, they’re also learning a lot about the power of books, their new (and totally unbelievable) town library, and how to work as a team. Kyle Keeley loves games of all kinds, and his favorites are the creations of the amazing Luigi Lemoncello, an eccentric genius who just happened to grow up in Kyle’s hometown. Kyle’s town has been without a public library for years, but everyone is excited that a new library is about to open–and that excitement only grows when it’s revealed that Mr. Lemoncello himself designed the new building. Kyle is sure that the library is awesome–even though he doesn’t like to read all that much–and he is determined to be one of the first people to see just how cool it is. An essay contest will determine which twelve seventh-graders are invited to a lock-in at the new library. Even though Kyle’s essay efforts are a bit rough, he is selected to spend the night in the greatest library the world has ever known! Filled with holograms, a Wonder Dome with changing scenes overhead, hover ladders that reach the highest shelves, state-of-the-art technology, and books galore, the library is more than any of the kids ever dreamed…and so is the contest that led them here. During this exciting day, Kyle teams up with some friends–old and new–and uses knowledge of books, the library, games, and Mr. Lemoncello himself to find a way out of this most unusual library. 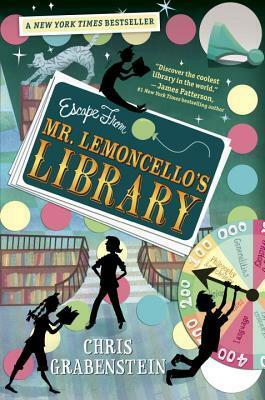 Will they be able to escape from Mr. Lemoncello’s Library before time runs out? Before someone else beats them to it? And what will they learn along the way? Play the game along with Kyle and company and see if you can figure out how to Escape from Mr. Lemoncello’s Library! Like the character of Kyle Keeley, I predict that many kids who read this book will find themselves making a list of books they need to read. From Sherlock Holmes to Harry Potter to the works of Dr. Seuss, Kyle encountered many wonderful stories in the library, stories full of fun and adventure that added to his enjoyment of his experiences in the library. Kyle wasn’t much of a reader before this contest, but that definitely changed in a very short time. Escape from Mr. Lemoncello’s Library is a captivating read that illuminates the power of books, libraries, teamwork, and fun in learning. It is a must-read for all who love children’s literature and those who believe that libraries–and librarians–can truly change lives. For more on author Chris Grabenstein, check out his website, Facebook, or Twitter.